This blog post is a summary of a workshop I ran at Mathsconf16 and 17. The session was called “The Pareto Principle of Lesson Planning” and the rationale was to explore how the Pareto Principle explains that the general relationship between inputs and outputs is not balanced. It can be the case that a small number of inputs can lead to increased outputs I explore this in more detail and use the context of teaching perimeter. What is the 20% of the input that contributes to 80% of the result? The 20% input is referred to as Atomising. This is the process where you break down a topic into its sub-tasks. This is a term coined by Bruno Reddy. The 80% result this achieves is that it allows pupils to develop flexible knowledge of the concept. Atomising avoids two common pitfalls. Firstly, it avoids re-teaching. I’ve certainly been in a position where I have taught a unit of work and then realised certain sub-tasks that I could have taught which would have helped my pupils develop a better understanding of the concept. Secondly, you avoid missing out sub-tasks to teach. When you breakdown a topic into its sub-task you avoid missing out certain aspects of a topic which really need to be taught explicitly. Due to the so-called ‘curse of knowledge’, teachers often forget that there are certain decisions and procedural knowledge that we have but which we forget to teach to the kids. Either it is so obvious that we think the kids already know it or, more commonly, we don’t realise which areas of the topic we are teaching pose difficulties for the kids. It could be that the difficulty is caused by a weakness the pupil may have in a different area of maths. For example, if a child is finding the missing side length of a shape, and the perimeter is a whole number, and the sides add up to a decimal, then the area of difficulty may be that a pupil doesn’t know (or remember) how to subtract a decimal from a whole number. Here are the 12 sub-tasks that I used to break down the topic of perimeter. I chose perimeter deliberately because I think it is a perfect example of a topic which is perceived to be very easy for pupils to learn. However, there are certain aspects of perimeter that I will identify which I don’t think are explicitly taught. I think this because I have seen this to be the case when looking through several secondary maths textbooks. What is a compound shape? The thinking time that went into breaking down the topic of perimeter took me 10 minutes. I think if I hadn’t gone through this process then I would have certainly missed many sub-tasks. In addition, it would have resulted in me having to do a lot of re-teaching. Please note that some images aren’t drawn to scale, unless stated. I started to teach perimeter using explicit examples where pupils had to deliberately add all the lengths. They had questions where the side lengths were labelled using integers, decimals (same number as well different number of decimal places), multiples of 10, etc. An example like the one above forces pupils to add the values because, even though the longest length has increased in size, the smaller length has decreased in size. This question is also designed so the shapes have the same perimeter. Here pupils are being taught to calculate the perimeter of a regular polygon using multiplication. They are taught that if you multiply one side length by the number of sides then you can calculate the perimeter. The sequence of questions shown above demonstrates that we can get the same perimeter despite the polygon changing and its side length changing. I have also deliberately designed the questions to communicate this flexible understanding of perimeter. From the first question to the second, the side length changed. When you move to the third question then the shape and side length change, but the answer doesn’t change. For the fourth question, the side length and shape have changed but the answer doesn’t change. Here pupils are given the perimeter of a regular polygon, and they know the number of sides each regular polygon has, so they need to find the side length of that regular polygon. Here the perimeter of the shape has stayed the same, but the shape has changed. Here pupils can see that when the number of sides increases, then the side length decreases, given that the perimeter hasn’t changed. They can also see examples where the side length can be a fraction. I haven’t asked pupils to convert the improper fraction into a mixed number because a mixed number communicates size in a way that an improper fraction doesn’t. 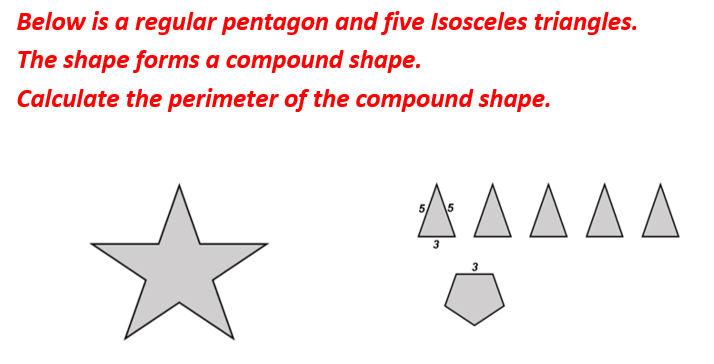 A mixed number would communicate more to a pupil about the side length of a square in relation to the side length of the pentagon in the previous question. However, the focus is not in understanding the magnitude of the square and heptagon. The focus here is to get pupils to state the perimeter of a regular shape given the perimeter of that shape. Pupils are practising the procedure of dividing the perimeter by the number of sides of the regular polygon, to find the side length. 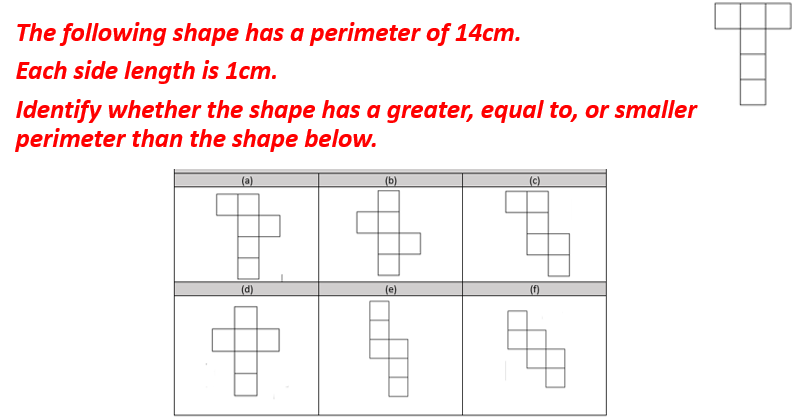 Pupils are then asked questions where they are given the perimeter and they must state which regular shape would have the greatest side length. This helps pupils to see that a regular polygon with more sides will have a smaller side length compared to a regular polygon with fewer side lengths, given they have the same perimeter. Within this aspect of perimeter, I also created questions where pupils had to find the perimeter of a regular shape knowing that the value of the side length is equal to the number of sides that polygon has. Here pupils are using their square number knowledge to find the perimeter of a regular polygon. I deliberately put in an example where pupils were doubling an even number for the first example and an odd number for the second example. I deliberately gave pupils the longest length in the first example and the short length in the second example. This is because I want them to see that I have changed the side length but the procedure to find the other length hasn’t changed. The third example uses a decimal because, when you double it, you get an odd number. When you subtract from the perimeter, you get an odd number, so when you halve the odd number you then get a decimal. I made the question arithmetically more difficult because I knew that in the first two examples the answer would be an even number which is divisible by two. I wanted to make a question where pupils could see that you can get a rectangle with a side length which is a decimal, and not a whole number. Here pupils can only give these answers, because the first value is A, and it must be larger than B’s value. In addition to this, I designed the question so pupils had to stop at 7 + 5 to avoid writing 6 + 6 because then the value of A and B would be the same. This is not what the question is asking. Here I deliberately used 8 and 12 in the first two examples to get kids to actively use the procedure to avoid being in autopilot mode. The numbers are similar for this reason. Pupils can then see that as the base length increases between the first and second question, the side length becomes smaller. In the final example I use an odd number for the base number, to deliberately get each equal side length to be a decimal. 3) Divide by 2 to find the value of each equal side length. Pupils here also see that, when the top parallel length increases from the first example to the second example, each equal side length decreases. Similarly, from the second to the third example, when one of the parallel lengths go from 5cm to 4.5cm, each equal side length increases. Pupils will learn what a compound shape is. They will then find the perimeter of a compound shape. I will use the L-shape compound shape because pupils will eventually learn that if you add the longest horizontal length and the longest vertical length, then double it, you will also find the perimeter of the shape. Pupils will see questions where they are working with integers, decimals, both etc. Here pupils will first be asked to find the missing length. They won’t be using the perimeter at all. This is because I want pupils to understand which lengths are related to each other, and which aren’t. In the second image, the vertical lengths are related because the longest length subtract the shorter length will find the value of A. These lengths are connected to each other. Similarly, in the second image, the horizontal lengths are related because the two shorter horizontal lengths sum to give the size of the longest horizontal length. These lengths are related. 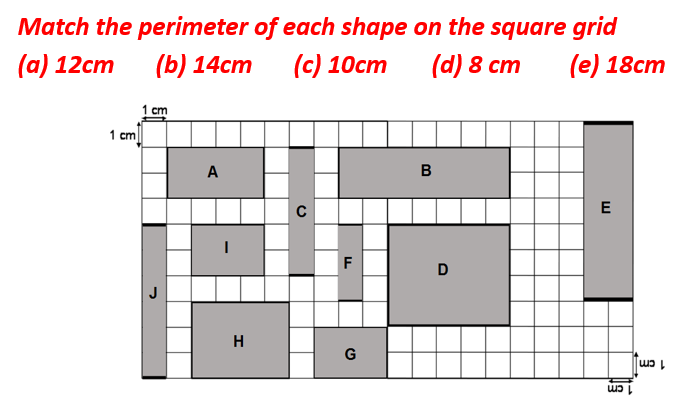 So, pupils will first practise finding the missing lengths without using the perimeter at all. They will then be asked to find the perimeter of the shape once they have found the missing values for A and B.
I then increase the difficulty in finding the missing length of a coumpound shape. Here we can’t find the missing lengths unless we have the perimeter. This is because the third image has two conneted vertical lengths which are missing. If the perimeter of the compound shape is 36cm, now I can find both missing lengths. 2) Given the perimeter, I must follow this procedure. I like these questions a lot because I have made the concept more difficult by not combining other perimeter with other concepts, or by making the numbers more difficult. I have taken the concept of perimeter with compound shapes and changed the amount of information given. The difficulty is within the concept. Pupils are moving onto identifying that the perimeter is something that can change by increasing, decreasing or changing shape, but the perimeter can remain the same. This also allows pupils to see that we can change the image and that the perimeter can change, but it also may not change. Pupils are now at a point where they are taking their knowledge of drawing rectangles with a specific perimeter which has been taught in this sequence, but now drawing it on a square grid. Pupils are then equipped to match a specific perimeter to a specific image. They are applying what they have learnt rather than answering direct questions.